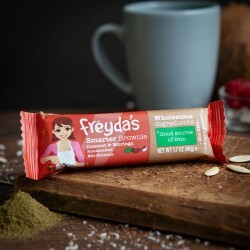 Founder Sharon created Freyda’s Pantry bars to help other mums because she needed them herself. After having suffered a traumatic birth with her youngest son, she was left with a number of health complications. Medical staff warned her she could be in hospital for some time and said she may need to top up breastfeeding with formula milk.Thanks to the natural goodness of her traditional family post-birth recipe, she was discharged in just a couple of days. Everyone was amazed and as word got out Freida’s Pantry was born! To make it even better, Sharon teamed up with Sarah Wragg, one of the UK’s top family and pregnancy nutritionists, to tailor the bars to Western tastes and make sure every mouthful is good for you and good for your baby too. As you’d expect, there are no nasty additives or preservatives. 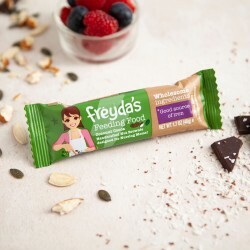 All the Freida’s Pantry snack bars are handmade in the UK.